No, Serendipity is NOT a new stamp set. Serendipity is what is considered a happy accident! As a stamper, I have a lot of those! LOL! When you sit down to create something, it doesn't always turn out the way you pictured it in your head, but most of the time, it turns out better! And then there are times when you create something and it's just not fit to show your dog. I should know, Buster and Susie turn their noses up at my creations all the time. But that could have something to do with the fact that they don't smell like biscuits or hamburger! So, the other day, I was casing a gorgeous card from the very talented Mary Brown (I'll be showing you my case one day next week) and I had my card all finished except for the greeting. Want to guess what happened next? Yeah, I kinda stamped the greeting crooked. Not just a little crooked so that I could adjust the ribbon a smidge to hide the slant, but really crooked. The kind that you just toss aside and start over again! 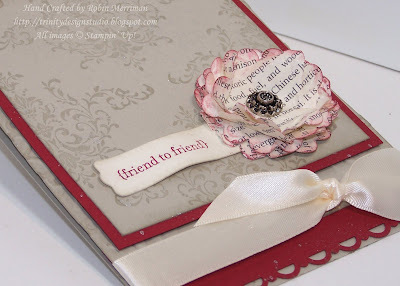 Not wanting to waste the whole stamped cardfront, I decided to cut off the crooked greeting - that got tossed out - and use the leftover stamped piece for a new card. Whaddya think? Do you like? I sure hope so, because I like it VERY much! This combo of Sahara Sand, Cherry Cobbler and Very Vanilla is just yummy! So soft and pretty, very soothing I think. The main panel is stamped with the flourish image from the FREE Sale-A-Bration stamp set, Bliss. It's tone on tone with Sahara Sand ink. I trimmed it down and matted it on Cherry Cobbler then mounted it on a card base of Sahara Sand that I ran through the Big Shot with my Vintage Wallpaper folder. I trimmed the bottom off a little bit and added a piece of Cherry Cobbler that I'd punched with my Scallop Trim Border Punch. The Very Vanilla Satin Ribbon was simply knotted around the front to hide the seam. Pretty, huh? I think my favorite thing on this card is the flower made with that First Edition Newsprint DSP. It was so easy! I punched out 4 pieces with the Scalloped Circle Punch, crumpled them up, sponged the edges with Cherry Cobbler ink and added the Vintage Brad in the center. Easy peasy! The greeting is from Teeny Tiny Wishes and is punched with the Modern Label Punch then curled to look like a banner. Both of those are adhered with Mini Glue Dots. For a final touch, I used my Vanilla Smooch Spray and spritzed it all over. It added the perfect finish! Have a wonderful day today! I'm off to get my hair cut and wisdom covered, so it will be fun to see if Mark notices when he gets home from work. Emma always notices, but Mark, not so much. Ah, well, at least he doesn't complain when he sees the checking account entry! This is so beautiful Robin, I am definitely going to be making one of those flowers asap! What a very pretty accident! 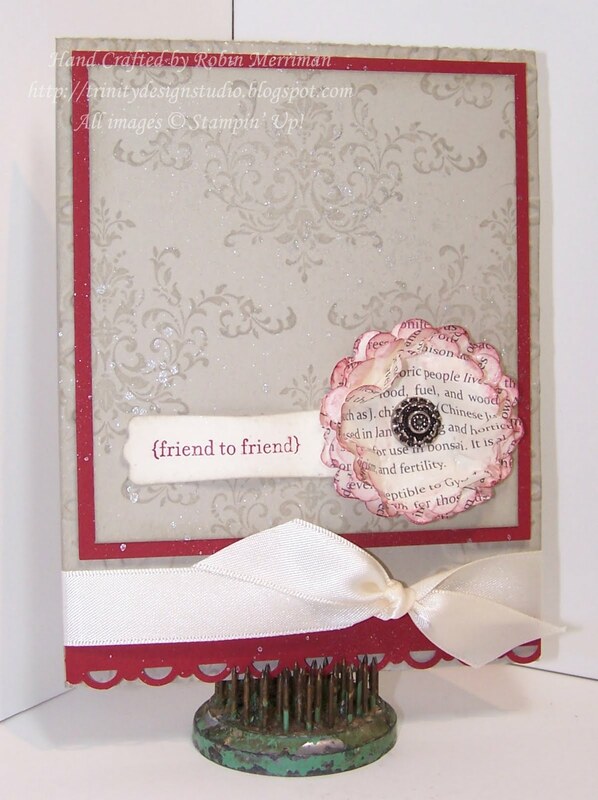 I love how you blended all that together for such a pretty card. The flower really sets it all off, too! Very beautiful! Bliss meeting serendipity indeed!! !